RENDEZVOUS is a private property conveniently located on the South Shore of St. John 5 minutes from Cruz Bay. The lushly landscaped property consists of three separate units which may be rented individually or in combination for larger groups, depending on your specific needs, 2-6 persons. Each apartment has its own entrance, parking and outdoor covered dining area. Each is completely private from the other two units. Rendezvous has a community pool with plenty of lounge furniture, shade sails and incredible view for the enjoyment of all guests. RENDEZVOUS VILLA(2BR 2Bath) The entrance of the top-floor Villa is on prestigious Boatman Road atop the hill between Rendezvous Bay and Chocolate Hole. Newly remodeled and decorated with origional artwork by island artists, the Villa boasts a modern open kitchen and huge outdoor covered porch for grilling, dining and lounging among the palm trees and outstanding sunset view of St. Thomas. Fully A/Cd. RENDEZVOUS TERRACE(2BR 2Bath) is currently occupied by Owner/Manager and not available for rent. Should you need anything during your stay or have questions or concerns, the manager is on-site to take care of you. RENDEZVOUS COTTAGE(1BR 1Bath) a romantic escape for two awaits you in this Mediterranean-style Cottage. The main living/dining area is an outdoor, enclosed, screened porch tucked into lush landscape of mature palms, bananas, and frangipani with a commanding sunset view of Pillsbury Sound and Saint Thomas. The arched windows and doors, high ceilings, and outdoor environment will put you at one with nature. The well-appointed kitchen, barbecue, king-size bedroom with air conditioning, walk-in closet with washer/dryer, and comfortable furnishings will provide you with all the comforts of home. Hike to nearby uncrowded beaches in Chocolate Hole and Rendezvous Bay, or take the beach chairs and cooler and explore National Park beaches. Or just lounge by the pool. Outdoor covered living/dining areas, high ceilings, arched windows and doors, ceiling fans, sattelite TV, books, phone and answering machine, comfortable new furnishings, king-size bed, air conditioning, well-appointed kitchen, barbecue, linens, beach towels and chairs, cooler, walk-in closet with washer/dryer, pool, sunset view, alarm clock, iron and ironing board. I'm from New York City, have lived in St. John since 1997 working for Westin, Ritz-Carlton and Marriott. I love the laid back lifestyle so decided I would go into the hospitality business for myself. This is the only property I own (or have ever owned) and have been renovating it since the day I bought it (the renovations never stop, always more to do!) I get to spend loads of time with my 6 year old son, native Virgin islander; we love hiking, hitting the beach, boating and travel! I also tend bar one night a week at High Tide, come by to see me! After life in the Big City and the suburbs of New York, life in my neighborhood could not be any easier. For a while I rented a home closer to Cruz Bay (too close) and for a year rented a place in Fish Bay (too remote). Rendezvous is perfect: 5 minutes to Cruz Bay bars, restaurants, groceries, shopping, ferries to St. Thomas. 15 minute drive to all of my favorite beaches on the North Shore, National Park and hiking trails. Easy to catch a boat to British Virgin Islands from Cruz Bay. Quiet, safe neighborhood where I know most of my neighbors and rarely bother to lock my door or take the keys out of my car. I have a big yard I'm always gardening with lots of sun and awesome sunsets, accross the street down Boatman road are awesome views east of Rendezvous Bay and the entire South Shore of St. John, with great sun and moonrises. Dish Network with HBO,Shotime & Starz channels free! It's difficult to describe how great the outdoor screened-in porch feels. You are surrounded by tropical plants and trees, with a great sunset view all the way to St. Thomas. You are outside feeling the awesome Caribbean weather but protected from the elements (and the mosquitoes), have comfortable furniture with ceiling fans and flat-screen TV and all the amenities. Many quests come back again and again for this and prefer it to the 2BR Villa upstairs. Our 1 bedroom was very comfortable, clean and the view was GREAT! James was a great host, from picking us up, renting his car, to dropping us back to the ferry at the end of our vacation. I would love to come back and rent the 2 bedroom condo's the next time we come back! A beautiful view and great pool area, very comfortable. GREAT PLACE.. WILL STAY THERE AGAIN! James was absolutely great, and so was his place. He makes sure you have everything you need, and you are comfortable. It is very clean, and not far from Cruz Bay at all. James was a gracious host. He provided absolutely everything we needed during our stay. 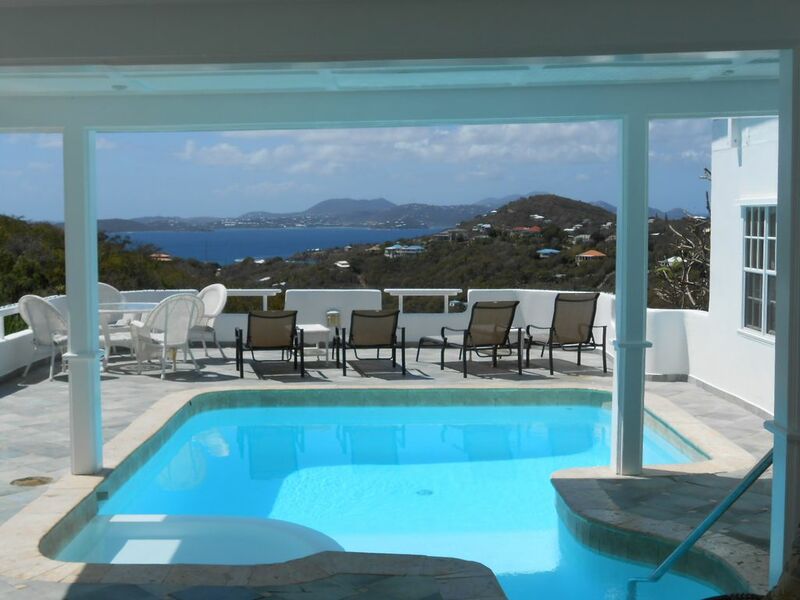 Home is close to Cruz Bay and the view from the deck/pool is incredible. We will be back soon! Tremendous value! We have paid twice what he charges for half the amenities and service. Fourth time to the island and I'm 100% sure we have found our new "home" to vacation at while on STJ! Really enjoyed this cottage. The screened living area is delightful at every time of day or night. Great view, pool and hot tub too, and the location feels private but close enough to town. James was very helpful, met us at the dock and dropped us off. Great spot on the beautiful island of St. John! Just got back from the cottage, it is a beautiful place to vacation in St. John. The cottage is a great place to stay has everything you need, our family of four stayed and it was very comfortable and had everything you would need for the beach (beach chairs, towels, cooler, etc.). Saved money by renting the car from James and it worked great. James picked us up and dropped us off at the ferry, and was a great host, you will not be disappointed with you stay here! Only thing we would change is to stay longer! Boatman Rd is a very upscale residential neighborhood adjacent to Chocolate Hole, great for walking to take in the phenomenal ocean views, and incredible cliff-side vacation homes. Very safe and low-traffic with access to the water in several spots, but very hilly! Also great trail hiking in the National Park, a short drive away. Within the 5 minute drive to town you will pass the Westin Resort and all the grocery/wine stores (St. John Market is a 2 minute drive). It is an easy drive home from Cruz Bay after a great restaurant meal or fun in the local bars and pubs. We are centrally located so getting to the some of the best beaches in the world is easy to do. Most north shore National Park beaches are a 15 minute drive. You can drive to Skinny legs in Coral Bay in about 20 minutes.